A polar bear climbs out of the water to walk on the ice in the Franklin Strait in the Canadian Arctic Archipelago, July 22, 2017. Climate scientists point to the Arctic as the place where climate change is most noticeable with dramatic sea ice loss, a melting Greenland ice sheet, receding glaciers and thawing permafrost. 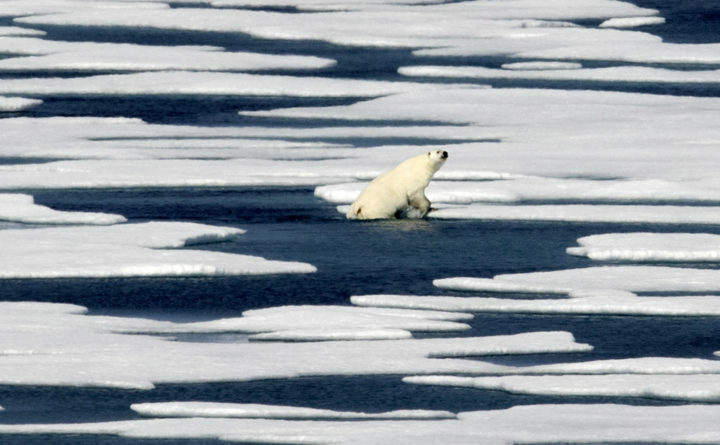 The Arctic has warmed twice as fast as the rest of the world since 1988. Thirteen thousand years ago, an ice age was ending, the Earth was warming, the oceans were rising. Then something strange happened — the Northern Hemisphere suddenly became much colder, and stayed that way for more than a thousand years. For some time, scientists have been debating how this major climatic event — called the “Younger Dryas” — happened. The question has grown more urgent: Its answer may involve the kind of fast-moving climate event that could occur again. Last week, a scientific team made a new claim to having found that answer. On the basis of measurements taken off the northern coasts of Alaska and Canada in the Beaufort Sea, the scientists say they detected the signature of a huge glacial flood event that occurred around the same time. This flood, they posit, would have flowed from the Arctic into the Atlantic Ocean and shut down the crucial circulation known as the “Atlantic meridional overturning circulation” — plunging Europe and much of North America back into cold conditions. The result remains contested, though, with other researchers still arguing for different theories of what caused the Younger Dryas — including a very differently routed flood event that would have entered the ocean thousands of miles away. Nonetheless, the story is relevant because today, we’re watching another — or rather, a further — deglaciation, as humans cause a warming of the planet. There is also evidence that the Atlantic circulation is weakening again, although scientists certainly do not think a total shut-off is imminent, and are still debating the causes of what is being observed. The shells contained a disproportionate volume of oxygen-16, a lighter form (or isotope) of the element that is found in high levels in glaciers. That is because oxygen-16, containing two fewer neutrons and therefore lighter than oxygen-18, evaporates more easily from the ocean but does not rain out again as readily. As a result, it often falls as snow at high latitudes and is stored in large bodies of ice. There has long been scientific debate about where all the meltwater actually entered the ocean, though — with some contending that it would have occurred through the St. Lawrence River, which flows past today’s Montreal and Quebec City and thus out into the Atlantic. Freshening is therefore the Achilles’ heel of the circulation. And the new study argues that although the glacial water would have entered the seas very far away near the present Alaska-Canada border, it would have then circulated around the Arctic, eventually traveling south past Greenland and entering the key regions that are crucial to the overturning circulation, which tend to be off Greenland’s southern coasts. Not everyone is convinced, though — including some researchers who have previously published results suggesting that the outburst flood or flow was instead to the east, through the St. Lawrence River. “They have produced a nice signal of the release of freshwater into the Arctic Ocean, but the conclusions are based on an uncertain chronology which, when trying to tie together events so closely, requires some independent confirmation,” Peter Clark, an Oregon State University geoscientist who has published evidence supporting the St. Lawrence River theory, said in an email. Both groups, though, think the flow of fresh water from the gigantic lake and from other melting events toward the Atlantic interfered with the ocean’s circulation — they’re just disagreeing about how it got there. The question thus becomes whether it is possible to even more dramatically interfere with the circulation again — and what could cause that. And yet, Greenland is no Lake Agassiz. “Greenland doesn’t have large land lakes to store the water,” Driscoll said. Rather, it releases steady streams of water in the form of glacial runoff, which often goes straight into the ocean — and it releases huge icebergs that slowly melt. Climate scientists will be quick to point out that even if the Atlantic circulation shows or shuts down, ceasing to transport as much heat and leading to some Northern Hemisphere cooling, the overall global warming trend will still be ongoing and may overpower it. We won’t directly repeat the Younger Dryas, but we can learn from it.